My friend Jeanne Williamson is an uncommon fiber artist. Along with having her work winning Best of Show at the Quilt National 2005, Jeanne is as prolific as she is creative. In addition to her large mixed-media pieces, she constructed one small fiber work every week for more than 7 years, and she has continued to make one 12” x 12" work every month for the past 4 years. Whoa! What inspires me most is how she plays with fabric by stitching, printing, layering, and even using beads to explore many ways to make her work her own. Jeanne has given me many swatches of her printed and altered fabrics. I get pleasure simply looking at them, but in the back of my mind was always the idea that I would one day use the fabric in my jewelry. Jeanne Williamson alters fabric with printing, stitching, quilting, layering, and more. 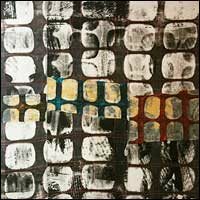 Shown: February 2010 12 x 12 series. Mixed media on canvas. 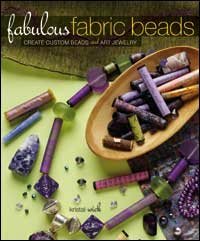 That day came when I saw the book Fabulous Fabric Beads by Kristal Wick. Kristal’s signature basic fabric bead shape got me most inspired. The book’s projects employ many exciting ways to embellish and print, stamp, bead, and more, but I found it easiest to focus on the simple cylinder as my starting point. 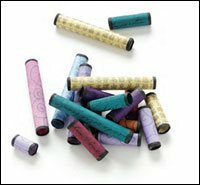 These cylinder beads by Kristal Wick are made from printed and rolled fabrics. They’re so easy to make, and her book tells you everything you need to make them. First I cut small pieces of Jeanne’s fabric and tied them with waxed linen into rolls, but found them hard to string. I then rolled and tied the fabric around pieces of wire with simple wrapped-loop ends. Now I could link the beads. Next, I focused on making the beads more my own. I wanted more texture. I tied other fiber pieces around them, using strips of soft nylon screening. I also could have used raffia, ribbon, plastic netting . . . remember fiber art is more than fabric. You get the idea. By wrapping my fabric beads around pieces of wire I had a simple way to link them together, as an alternative to stringing them. 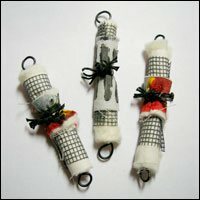 Wrapping fabric or fiber strands around another bead will make it your own work of art. I spun off one of Kristal’s covered shapes and made my own ribbon-wrapped donut. I added knotted fringes and waxed linen, with a vintage button over the center hole and a fabric bail. Go green! Cover something you’d otherwise trash. My ribbon-covered donut is a 2" foam circle from a spindle pack of DVDs. I bet your creative story includes chapters about fabric or fiber art. Why not bring it back into your work as a beader? Start with Fabulous Fabric Beads for some really tasty ideas and projects, and see how much fun it is to play! 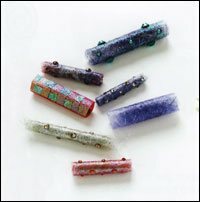 Easily transform an ordinary plastic straw into a shimmering bead with the Angelina Fiber Bead project by Kristal Wick, from her book, Fabulous Fabric Beads. 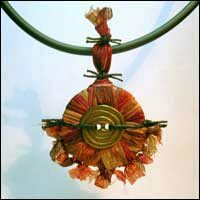 Post your favorite fiber-related jewelry projects in the Forum Gallery on Beading Daily!